You guys! These Coconut Berry Fudge Cups are so good!! If you like my coconut almond fudge, or my lemon coconut fudge, then you will also love the coconut berry fudge cups. They best part? They are super easy and only take 4 ingredients! Only 2 tablespoons of added sugar in the entire batch. I made mine in standard sized muffins pans, but you can also do these in mini muffin pans for a bite sized treat. These little bites of fudge are vegan, gluten free and paleo. I know it’s kinda early to mention this, but as I was making them, I thought they would be great for Memorial Day or 4th of July parties. Don’t you think? These fudge cups literally only took a few minutes to make! Looking for more coconut recipes? In a food processor , combine all ingredients but the fruit. Blend until smooth. 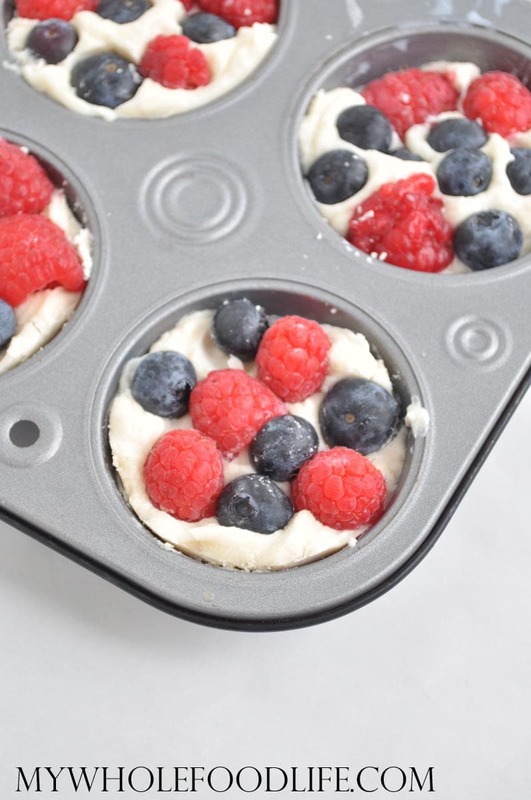 Spoon mixture into lined muffin pans . Please make sure to use greased liners for this recipe. Silicone liners will work best, but paper liners should also work if you grease them. Press the berries into the top of each cup. Stick the whole thing in the fridge to firm up. This should only take a few minutes. Those look so yummy! I'm always looking for ways to use coconut butter. Would this work with coconut milk or hemp milk instead of almond milk? I realized a few weeks ago that coconut butter is coconut manna sold by Nutiva. Delish! I spread it on a toast instead of butter. These would be amazing too, I'm sure. I love coconut manna! So yummy! It's a coconut fudge made with the coconut butter. Wow. With this coconut butter/coconut manna, you are opening up a whole new direction for me. I am always looking for a new way to add coconut to my plate. Thanks for another great recipe. You are so welcome Megan! Those berries look super yummy! I have these firming up in the fridge right now! I used frozen blueberries since I didn't have fresh. Can't wait to try them! Awesome! I hope you enjoy them! I loved them! They're tasty even without the fruit but it adds another dimension to them. Thanks for the recipe! Would coconut cream work in place of coconut butter? I'm not sure if there's a difference? Has anyone tried it with cashew milk? It's the only kind of milk I have on hand, besides my kid's raw milk, and I'm dying to make this! Is there any way coconut oil would work? I'm new at all the coconut cooking techniques!